North Carolina guard P.J. 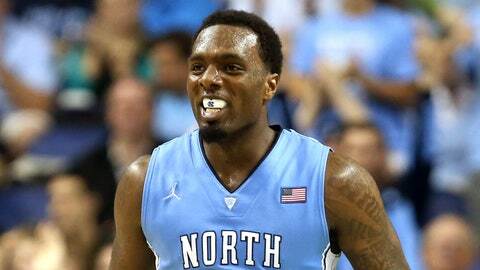 Hairston averaged 14.6 points per game last season for the Tar Heels. CHAPEL HILL, N.C. — The University of North Carolina announced today that it will not seek apply for the reinstatement of junior guard P.J. Hairston, who has missed the first 10 games this season because of NCAA eligibility concerns. UNC head coach Roy Williams couldn’t help but get emotional when talking about Hairston, the player he suspended indefinitely in late July before earning a spot back on the roster while the NCAA issues were being sorted out. "It’s probably the most difficult and saddest thing I’ve ever gone through as a head coach. … It’s been a difficult time period for all of us," Williams said. "It’s been an extremely difficult time period for me because you’re talking about a young man that I have been so mixed, because I was so mad early, and I have been so proud of him. He’s handled everything, and I admire him — I don’t admire the actions that caused it, and he knows that. But I admire the way he’s handled things so greatly that it’s off the charts." Hairston had a tumultuous summer off the court, and when he was cited for speeding in May and for possession of marijuana in June, it was revealed that on both occasions, he was driving rental cars in the name of either local party promoter (and convicted felon) Haydn "Fats" Thomas or those close to Thomas. That news started an NCAA investigation into Hairston’s relationship with Thomas. Additionally, in another NCAA investigation, it was later revealed that senior guard Leslie McDonald had his image used without his knowledge to promote mouth guards. The NCAA and UNC were working together in what athletic director Bubba Cunningham called a joint review in both the case of Hairston and McDonald, and both entities had to agree on the facts involved in both cases in order to reach a resolution. McDonald ended up serving a nine-game suspension, and returned to action for the first time against Texas when his request for reinstatement was granted. The NCAA’s statement regarding McDonald’s case said that North Carolina had yet to apply for reinstatement for any other student-athlete, leading to speculation that Hairston’s Carolina career could be over. And when the documents related to McDonald’s reinstatement application came out Thursday, that became even more clear. The money Hairston was going to have to pay back was going to be substantial, as he was the primary user of the rental cars. McDonald received multiple impermissible benefits from multiple sources, but the majority of it was as a secondary user of the rental cars. Cunningham said that he informed Hairston of the decision on Wednesday before North Carolina played Texas. "I met with him personally and his mother on Wednesday," Cunningham said. "(The conversation was) very difficult. Very emotional. He’s been hopeful the entire time. We’ve all been hopeful the entire time that he would be able to play again. But by the time we gathered all the information and worked with the NCAA, it just wasn’t there." Cunningham was asked directly if Hairston lied to the NCAA. "Everything was a factor in the decision," he responded. "All the information that we collected, we tried to reconcile all of it with the information that we collected from a lot of people. At the end of the day, we just didn’t think we had enough in conjunction with the NCAA to submit reinstatement." Williams, whose team is 7-3 and lost to Texas on Wednesday night in spite of the return of McDonald, had yet to speak to his team about Hairston as of Friday afternoon before practice. The ongoing process has been largely a university and NCAA issue, and Williams said that he’s largely been in the dark in regards to both McDonald and Hairston. But he also acknowledged the difficult position he was in as their coach. Williams looked as frustrated and sad as his words indicated. Without P.J. Hairston’s contributions, the Tar Heels are 7-3 with three wins over top-15 opponents this season. "The head coach is sort of stuck in the middle because he wants to know and he understands. He sees the NCAA’s part. He sees the institution’s part. He sees the kid’s part. The head coach is the one that’s involved with the turmoil at a greater degree than anybody else," Williams said. "Not saying that there’s not turmoil for our administration. I’m not saying that. But the head coach is involved in the turmoil from a personal standpoint. I’m the guy that goes and sits in the living room. "Losing is always sad, and I’ve always said many times, the only difficult thing about coaching is the lows are much lower than the highs are high. But from a personal standpoint, this is the lowest moment that I’ve gone through in 26 years that I can think of." Williams understandably refused to acknowledge that there were any positives to the decision being made after having taken so long, because of the way it impacts his team on the court. But sophomore guard J.P. Tokoto said he was relieved that there was closure on both Hairston and McDonald’s situations. "Now we know as a team what’s going on with what the final decision is (and), we can finally get things finalized and figure out who we are as a team and what we have and who we can work with this year," Tokoto said. It’s unclear what Hairston’s future will hold. He has been practicing with the team all season and will likely continue to do that — Williams called him "at times the most dominating perimeter player (he) has ever coached." Williams said that he and Hairston would have "close, personal conversations" about Hairston’s next step. Tokoto said that Hairston has spoken to the team since he found out, and he encouraged them to move on. "Of course, he’s hurt by the news, as is everybody. But his message to us was just kind of, we’ve got to come together as a team. We can’t let this affect us, the way we’ve been playing. We’ve just got to keep rolling."